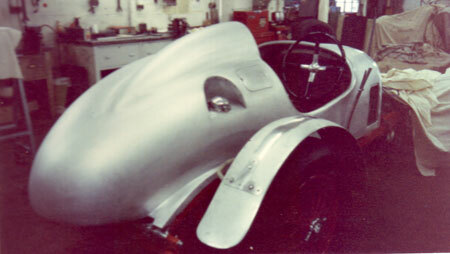 This project was my first big vintage Bentley 3/8 special. The client the late Spencer Flack was after what is known as a Beatle-Back rear with sweeping rounded shapes. Unique aspects in this body included a recessed petrol cap and the lid in front housing the oil tank. These were amongst a clutch of unique incorporations that weren’t necessarily seen in standard racing cars of its era but was what the client was after. McKenzie Guppy as always did a fantastic job putting it all together. I look back at this job fondly especially working with the team at McKenzie Guppy. Sad thing for me was that some time after I happened to be at Beaulieu at their Autojumble running a stand along with Ian Skinner, the furniture maker and coachbuilder, and I was confronted by two people who were certain that I had not built this body and it was built by another outfit somewhere. It just goes to show that now and again you’ll get people laying claim to work that is not there’s. John Guppy, Barry Guppy’s brother who was trading separately from McKenzie Guppy’s used to build his own Bentley’s including this extremely quick 420bhp 3/8. John also built the famous Donington Bentley’s during the 1970’s. There is also a big undertray we fabricated that you can’t properly see in the photos. This vehicle was made for a Swedish client and they had already constructed the tubular frame which was sent over to me to skin. Again there were a number of unique design aspects to the car which you won’t find on other 3/8’s. 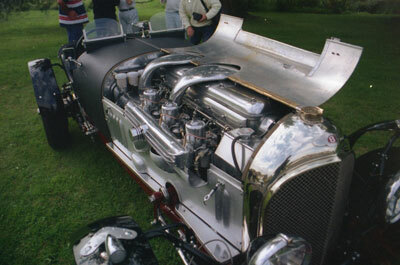 Another quick John Guppy Bentley with very distinctive features was this 1924 Twin Turbo. We produced all the panelling including the mudguard wings, front valance, deck boards, bonnet and those eye catching twin turbo pipes across the top of the engine. John says this car produced over 800bhp at Janspeed’s rolling road testing facility, quite phenomenal figures. I later found out from Joe Harding that this car ended up in Jay Leno’s collection in the states. John is now retired yet still is as sharp as ever when it comes to making these Bentley special engines go so quick. All the trim work for both these John Guppy cars was by the excellent trimmer Ian Best, Tarrant Valley Trimming.